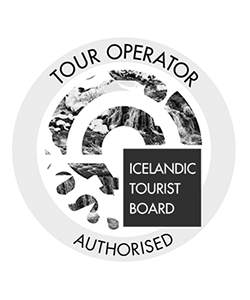 This magical tour will take you on an epic odyssey through some of the most incredible places that the land of fire and ice has to offer. It begins with the famous Golden Circle route featuring – gold tinted waterfalls, bubbling geysers, craggy seismic fissures between continents, areas steeped in history and much, much more. 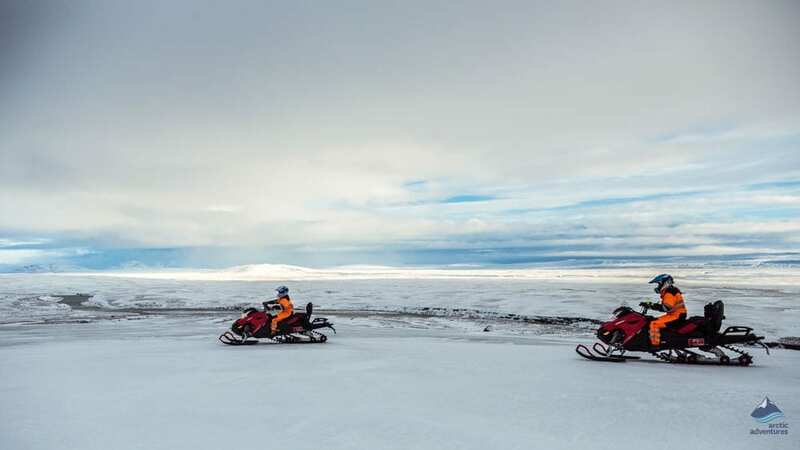 Then we will head to Iceland’s second largest glacier for a heart-pounding snowmobiling experience that combines exhilarating fun and majestic natural scenery. The tour ends in search of the legendary Northern Lights, whose flickering colors are as close to the supernatural as it is possible to be. 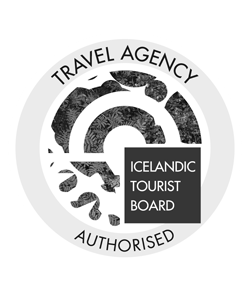 If you want to maximize your time in Iceland and see everything that the land of fire and ice has to offer, then this day-long tour is perfect for you. 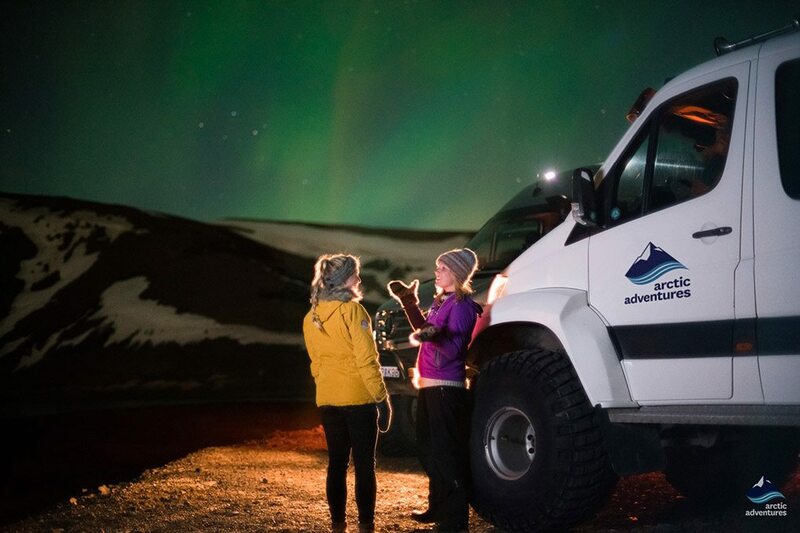 Your adventure begins with Super Jeep pickup service from our designated collection points in the Reykjavik area. 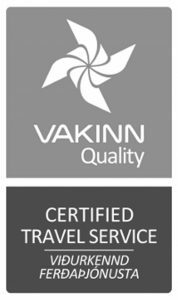 Once everybody has been picked up we make the scenic drive to Thingvellir National Park – the start of the famous Golden Circle Route. Thingvellir National Park is a UNESCO World Heritage Site that is part of the geological and historic fabric of Iceland. It plays host to Althingi – where a gathering of Viking nobles convened the first Icelandic Parliament in 930 AD. 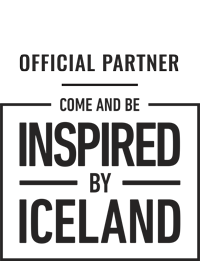 Icelandic parliaments met there annually from then on and Iceland’s modern parliament still bears the same name – making Althingi one of the oldest continually running democratic institutions in the world. Thingvellir also straddles the Mid-Atlantic Ridge, which bisects the continents of North America and Europe – offering visitors the unique opportunity to gaze across the craggy seismic fissure that divides two continents. 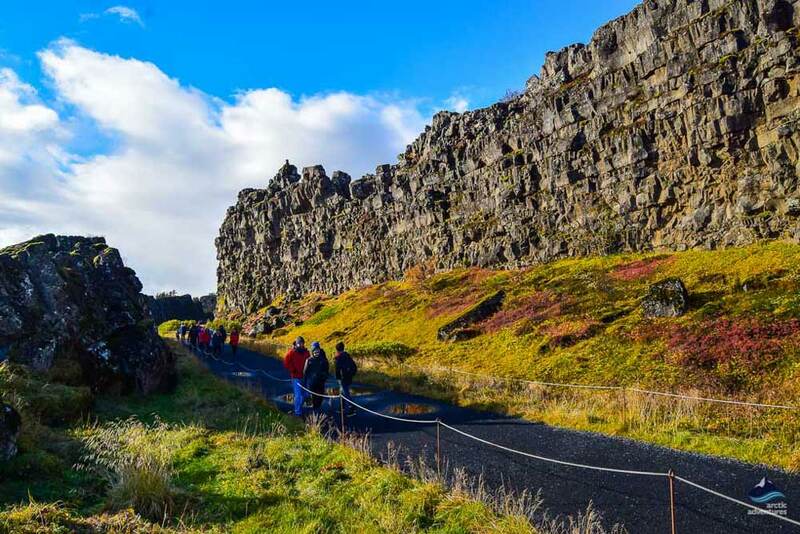 This alongside a host of fascinating rock formations, dramatic glacial waterfalls and much, much more makes Thingvellir an absolute must for anyone visiting the land of fire and ice. 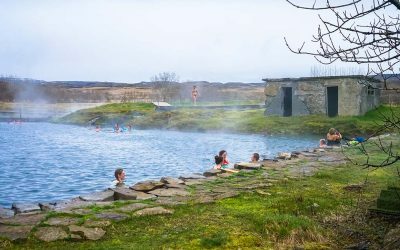 Our next stop will be the iconic Geysir geothermal area – famed for the violent geysers that have become synonymous with Iceland. 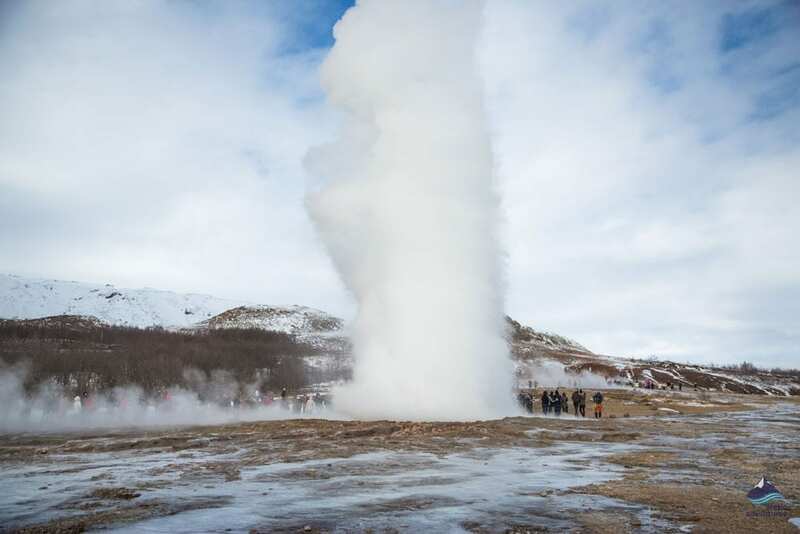 The most famous is the, now dormant, Great Geysir – the first to appear in the English language and the one that gives all geysers their name. 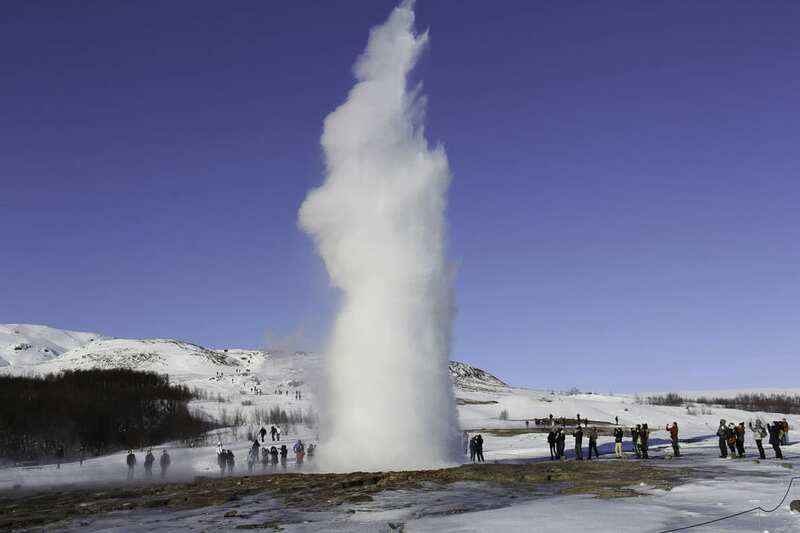 We will also see the very much active Strokkur, which fires molten streams of water up to 25 meters into the air every 4-8 minutes. There is nothing quite like seeing this miraculous natural phenomenon in the flesh and it will give you a profound perspective on the vicious power of mother nature. 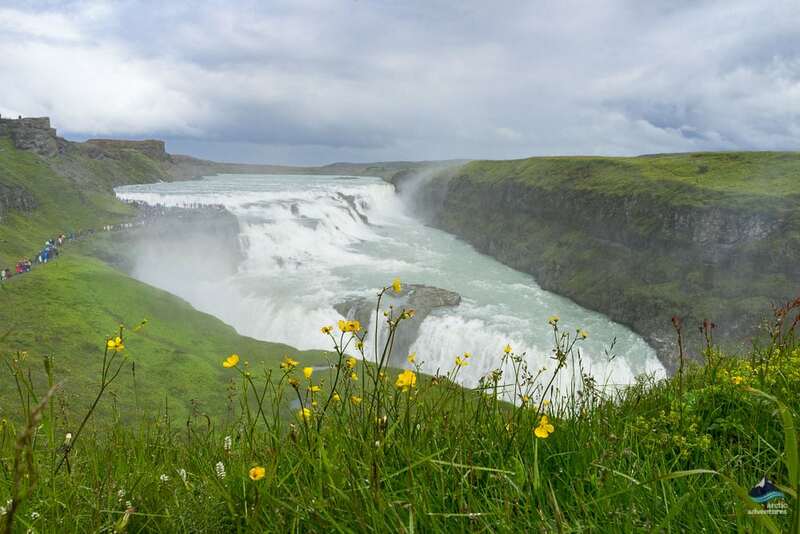 The final stop on the Golden Circle Route is Gullfoss (the golden falls) – a majestic glacial waterfall that crashes over three dramatic lava steps into a verdant valley below. It gets its name from the golden hue its water takes as it cascades over the volcanically crafted rock. Rainbows regularly form above the falls on sunny days – creating a magical and very photogenic scene that will remain with you for the rest of your life. We will then pause for lunch in the impressive Gullfoss Café – where we can enjoy traditional Icelandic cuisine to a truly incredible backdrop. 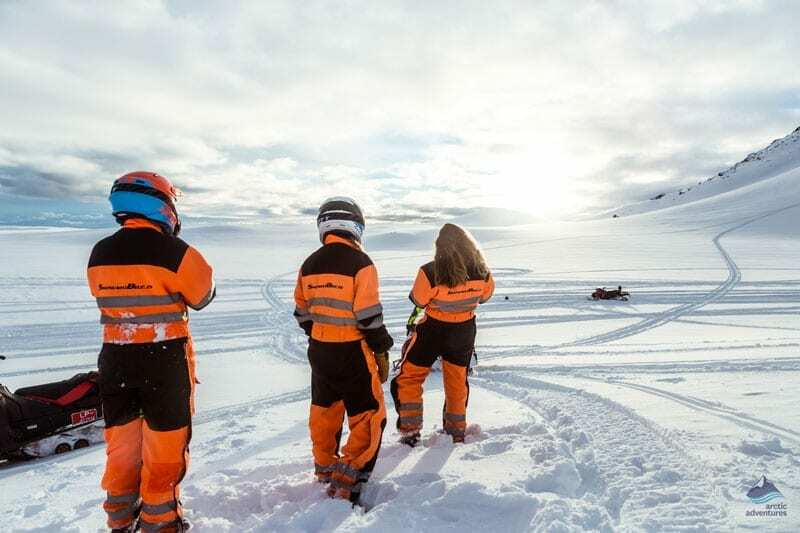 After lunch, we will head to our basecamp at the foot of the Langjokull Glacier for an adrenaline-pumping snowmobiling experience on an icy natural wonder. 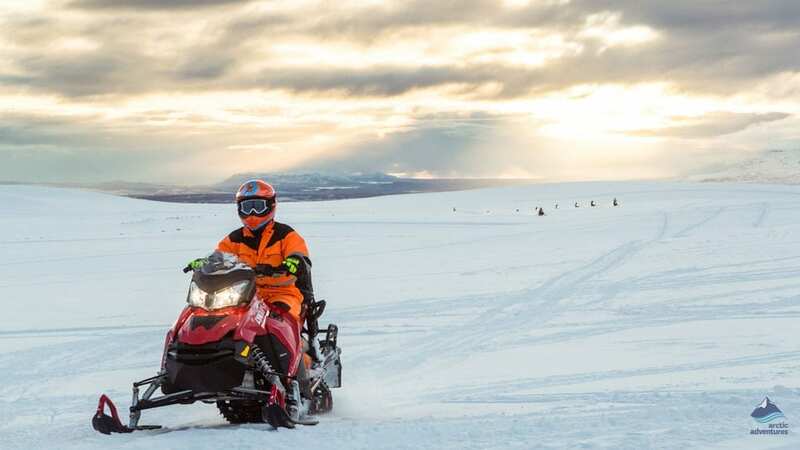 The adventure begins when we meet up with our friendly guide, who will provide us with all the gear that we need and teach us how to ride a snowmobile safely. Then, once everyone is ready, we will head out onto the vast untouched glacial wilderness for a few hours of exhilarating fun and majestic natural scenery. Langjokull (The Long Glacier) is a unique place – a sprawling expanse of untouched white snow that is crisscrossed by stunning icy crevices and glorious ice sculptures. 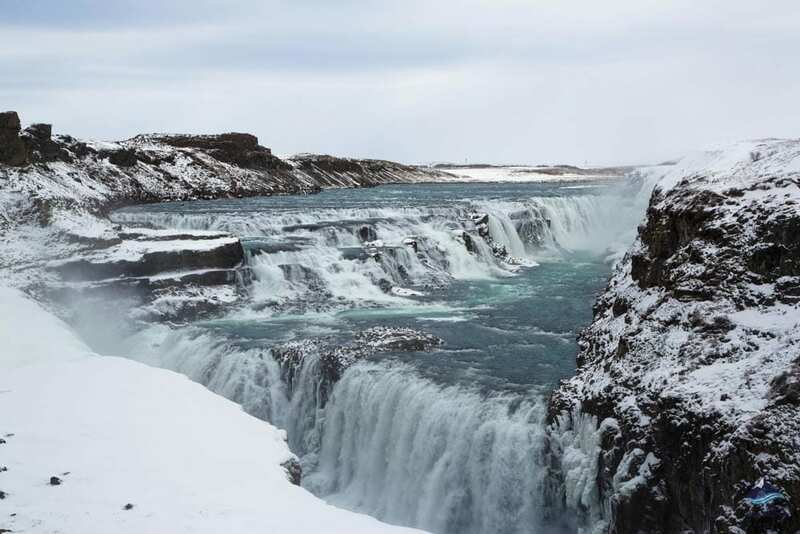 There are several dramatic volcanic craters hidden beneath the ice that provide a fascinating insight into the powerful natural forces that have crafted the land of fire and ice. 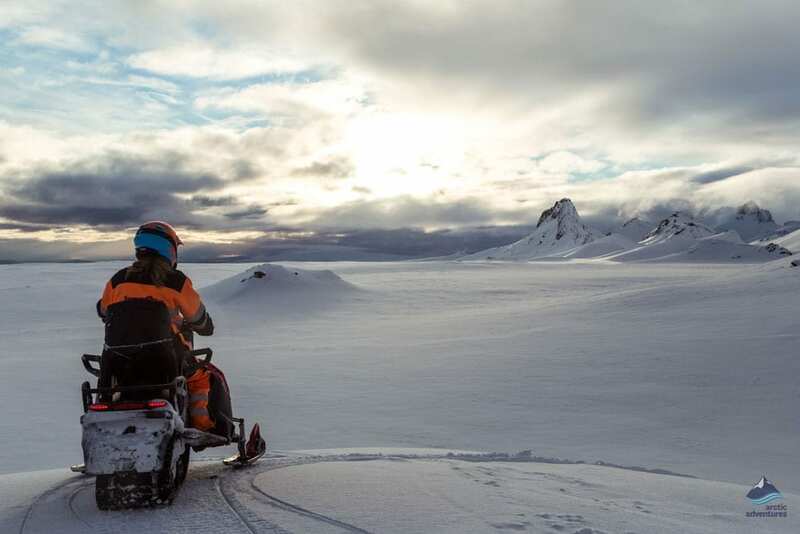 Langjokull is surrounded by towering volcanoes and mighty mountains – ensuring that we will enjoy spectacular vistas from the back of our snowmobiles. 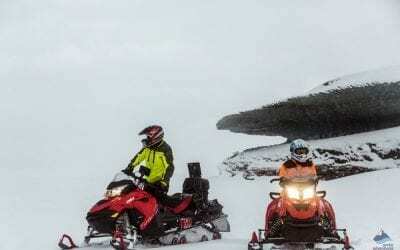 Snowmobiling across this unforgettable landscape is an exhilarating and awe-inspiring experience that you will treasure for the rest of your life. 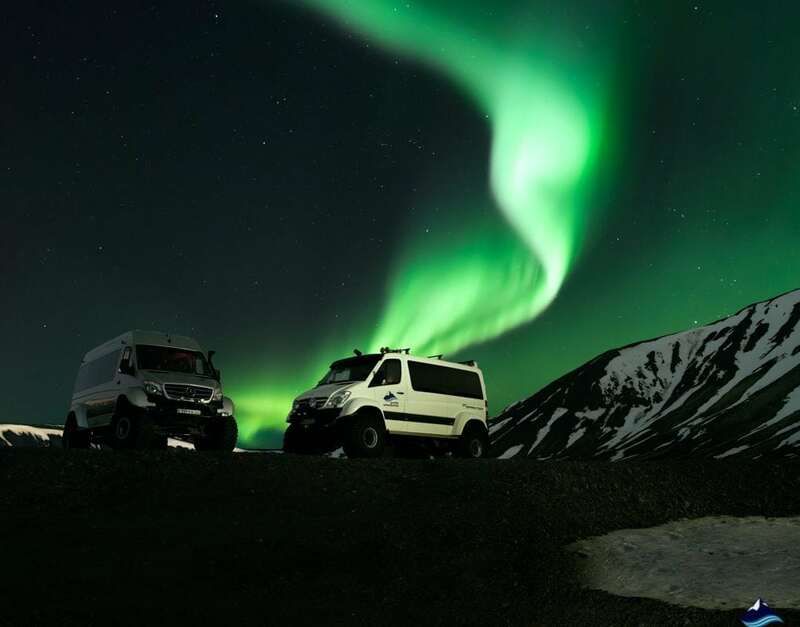 We will then head back to Reykjavik and drop you at one of our designated collection points, so you can enjoy a quick dinner before we head back out into the Icelandic wilderness in search of the heavenly light show known as the Northern Lights. The flickering colors of the Northern Lights have enchanted sky gazers for millennia – as the dark night sky is illuminated by dancing shades of green, purple, pink and red. It is a truly unique experience that will inspire awe and wonder in equal measure. 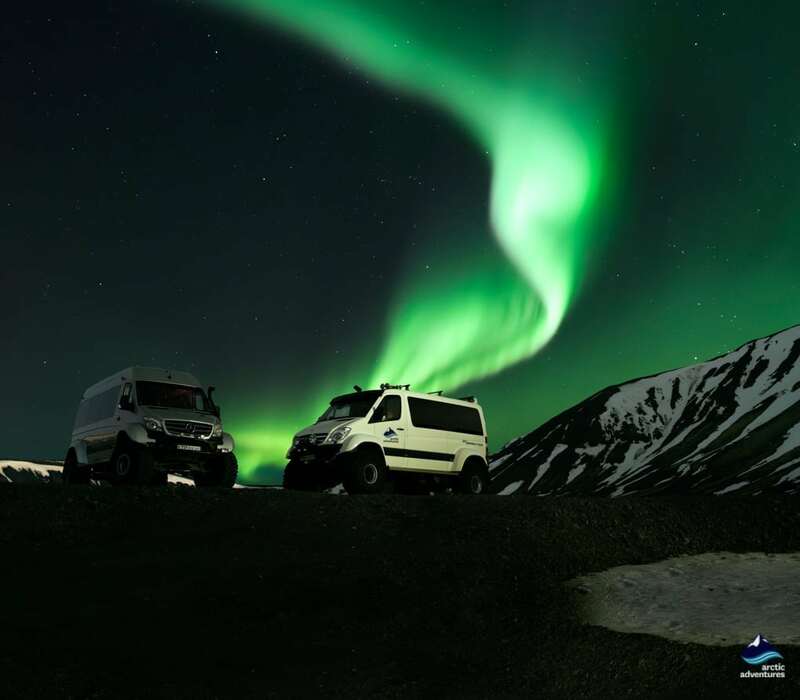 We use specially designed super jeeps that are capable of leaving the well-trodden path and traveling to places that are untouched by light pollution, ensuring that we can enjoy this spine-tingling natural wonder in all of its glory. One of the things that makes the Northern Lights so magical is there elusive nature and it is impossible for us to guarantee that you will see them on any particular night. 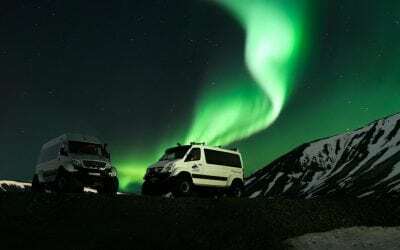 However, our expert guides will use a combination of the aurora forecast, prevailing local knowledge, and the weather conditions to maximize our chances to see this natural miracle. 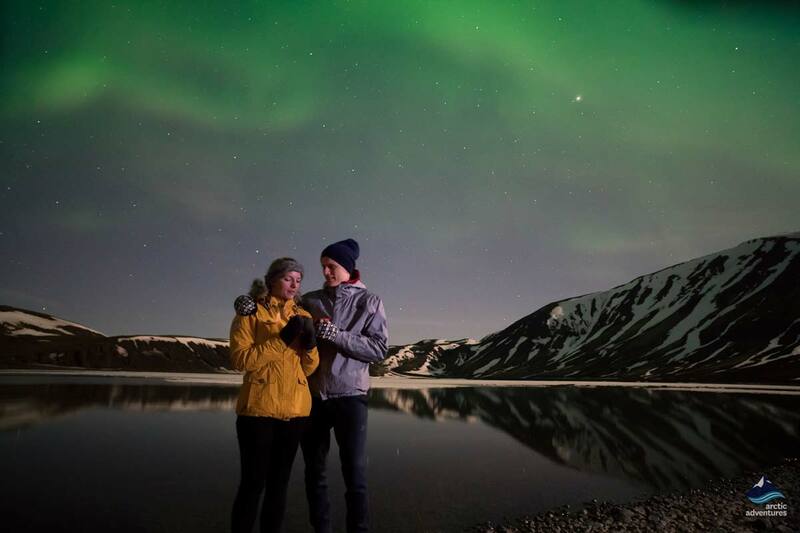 If we are lucky enough to see the sky illuminated by the Aurora’s flickering colors – then we will be in for a bucket list experience that is the perfect end to a magical day.